Contact center service is a comprehensive method that helps you stay connected with your customers round-the-clock. We know that satisfied customers keep coming back to you for more business and are more likely to stay with you even in times of big changes. 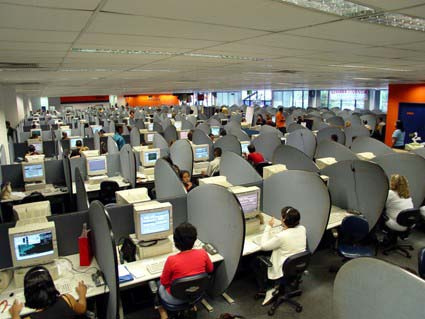 Contact centers are committed for providing quality services that help you build this customer loyalty. Whether you take orders over the phone or you take many customer service calls, an inbound call center can improve your business operations. A telephone answering service is ideal for the company that deals with many calls per day to order products and services. That can easily be outsourced to another organization and save time within the business itself. But even things like general customer service calls, complaints and inquiries can be handled by a properly trained inbound outbound call center. Today, India has become the outsourcing hub of the world. As more organizations understand the importance of focusing on their core competencies, they are turning to Indian offshore call center providers to manage their critical but non-core processes. This strategy helps them strengthen their brands and better manage their reactions to changing market dynamics. India has extensive experience of working with diverse customers in different industries. Corporate giants in the United States, Europe, and Japan as well as many Fortune 500 companies are leveraging the expertise of Indian service providers to minimize costs without compromising on quality. In this way, India has many advantages that help its offshore call centers provide cost-effective solutions to global organizations.